Written by Janet Choi on August 20, 2015 . Are you letting your true colors shine through in your emails or are you too afraid to let them show? Businesses often fall into the trap of making their first emails product-centric and come up short on personality. They throw a bunch of features, links, and stock words at recipients without securing them to the “why” driving their product and company — and that’s an opportunity wasted. When people sign up for your service, they’re excited to learn more about you. They’ve voluntarily opened a brief but valuable window of opportunity to make a positive long-lasting impression, even before really getting started. By telling your customers who you are and sharing your company’s mission and purpose in your first emails, you provide an immediate way to connect. Yes, it’s email marketing according to the wisdom of Cyndi Lauper, who sings of seeing “Your true colors, and that’s why I love you.” Your true colors help people figure out how they feel about you — and your first few emails provide pivotal moments to let them show. The point of a welcome is the person being greeted, not the greeter. That’s why welcome emails that overfocus on product usage fall flat. When Groove tested hundreds of emails to optimize their onboarding messages, they found that centering welcome emails around the product proved to be the least productive approach. Why? Product-based emails usually reflect the company’s priorities instead of the customer’s. 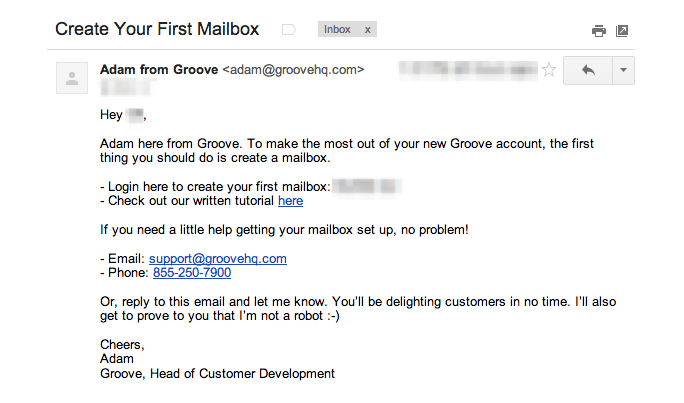 Let’s look at Groove’s old post-signup welcome email: As Groove CEO Alex Turnbull admits, this email contains “useless product tidbits that had little to do with what the customer actually wanted.” And it showed in the metrics, with open rates of 28% and overall trial-to-customer conversion rates of 8%. From this email, you’re left wondering who Groove is and what it’s all about. Nothing in the message — from subject line to body copy — really acknowledges that the recipient is somebody new to the Groove universe, besides the command to create a mailbox. 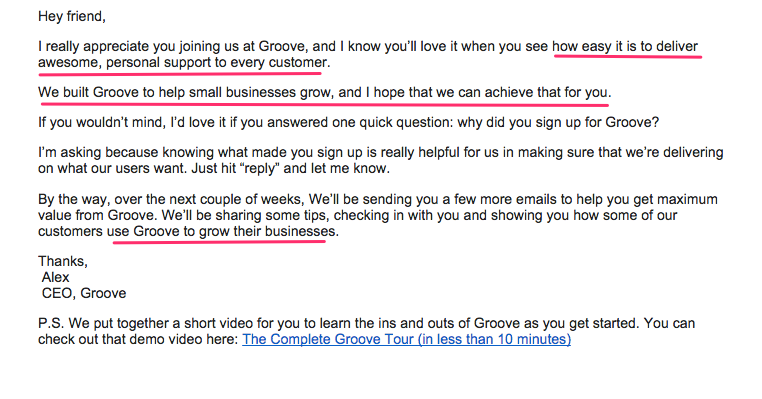 This email communicated what Groove wanted rather than helping people understand why they would want Groove. Showing, not just telling Groove’s value — personalized service — by establishing a personal connection with the trial customer. Starting a conversation around the product by asking trial customers why they signed up for Groove to identify specific needs and gain qualitative customer data. Planting the product seed — setting the stage for subsequent product emails in the onboarding sequence. It’s simple: write not about what you want from your customer but what your customer wants from you. Product emails are me-centric. Connecting introductory messages with your mission and vision help make them customer-centric. You have more than one chance to talk about specific product features and actions you’d like people to take in a trial period. Lead with your company’s purpose, and you’ll make an impression that will stick in your customer’s mind and frame the onboarding interactions to come. 1. Garner trust through transparency. Effectively communicating your philosophy helps gain trust — one of the core assessments your new customers make in their purchasing decision. 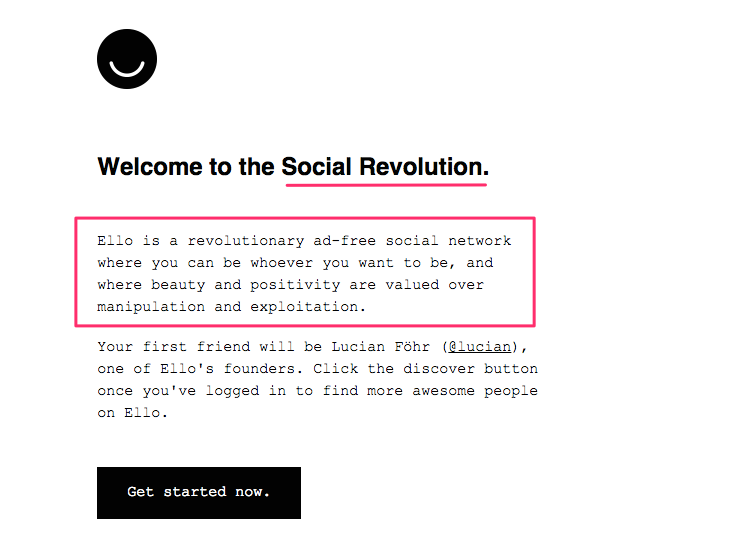 Check out how this works in Ello’s welcome email: Ello positions itself as the anti-Facebook, a social network you can trust with your personal data because they refuse to show ads. They prove this by committing to that vision front and center. In fact, it’s nearly entirely on the back of this origin story that got Ello to over 1 million users and $5 million in venture funding. It’s not uncommon for B2C companies like Ello to rely on philosophical notions or mission-based marketing in their outreach (think of companies like TOMS or Starbucks), but why should the case be different for B2B companies? 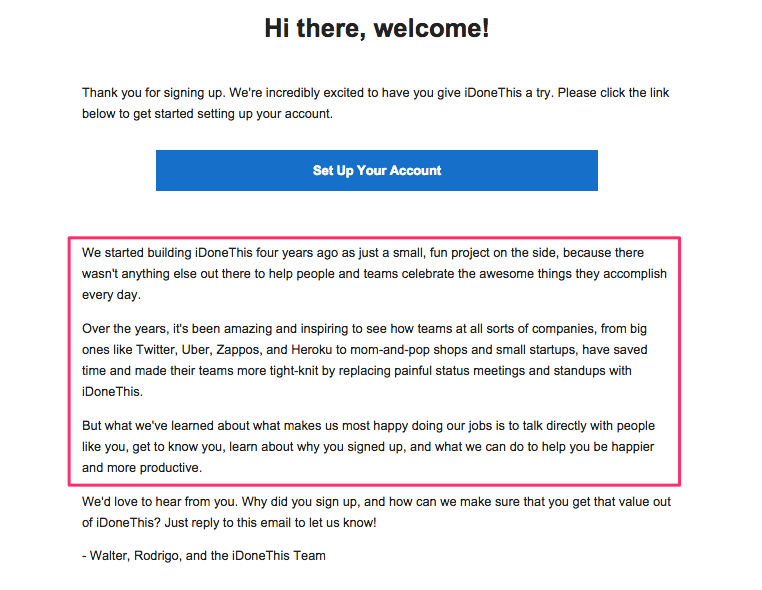 Here’s a B2B example from iDoneThis: Like Ello, iDoneThis explains its mission in their welcome email, but with an even more personal message from the founders. New signups gain an understanding of why iDoneThis exists for them and experience the transparency of a company that leads with its origin story and welcomes conversation from the get-go. 2. Create product differentiation by framing with vision. Sharing your most basic beliefs, concepts or attitudes sets you apart from the crowd. These “true color” details of your company’s philosophy and reason for being are unique to you. For example, the writing app and productivity space is extremely crowded, but BlankPage zooms in right away on its mission: to reach your writing goals and write more than ever before. 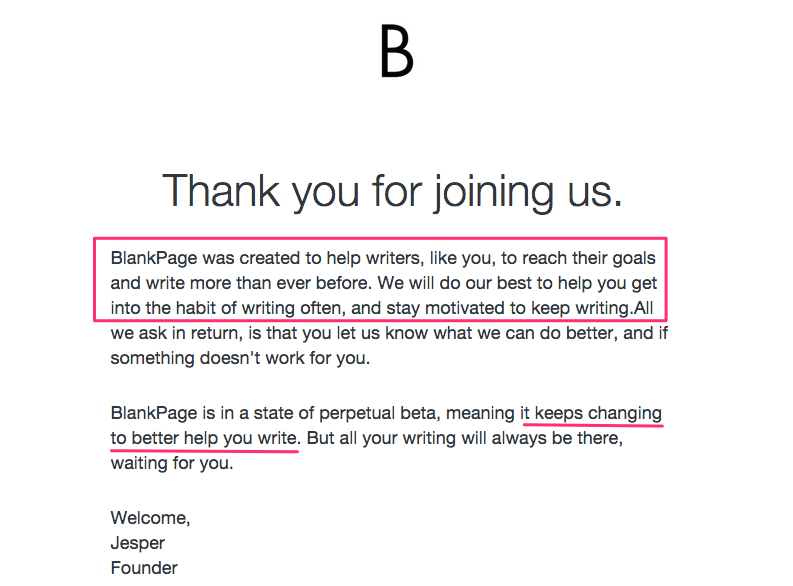 BlankPage has some neat outlining and editing features, but highlighting those in the first message risks getting muddled in a crowd of other writing and word processing products. Instead, they highlight their vision in a way that directly connects with the motivation of the reader, which also sets up a lens for understanding any features written about or experienced in the future. It can be scary to come right and say who your product is for, because you’re afraid of losing customers who don’t fall into that group. This is especially tough for young companies who feel incredibly grateful for any customer they can get. The problem is that the more that you try to market your product as being for everyone, the more difficult it will be for people to connect. 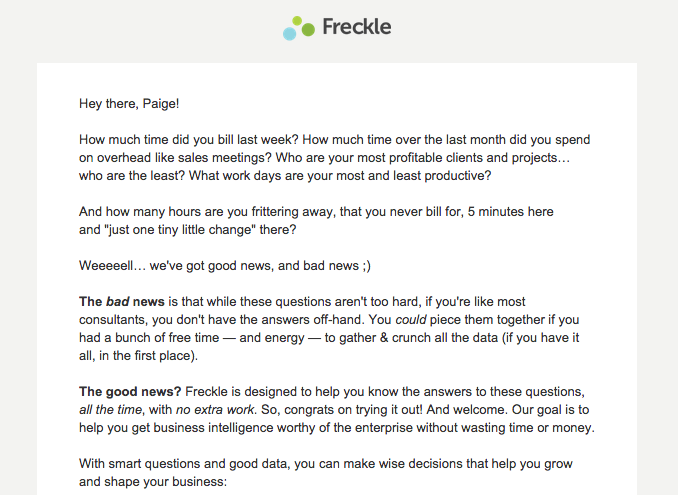 This onboarding email from Freckle doesn’t just give an identifying shout out to its target customers: agencies and freelancers. It sympathizes with the greatest struggles that they face. When you read this email, you get the sensation that you’re using a product built by people who understand your pain firsthand, and that’s a powerful affinity to build. Window shopping these days can take the form of signing up for something without being really ready to buy. Someone trying your product today might not be ready to use it in that moment. Or people try your product as it is today and find that it’s not quite what they’re looking for — but the need may very well persist. Establishing a connection over your company vision paves a clearer path forward. Build for the long-term with your audience instead of getting caught up in short-term conversion. Quip’s welcome email illustrate this point. Their vision is to be the first productivity app that really works well across every device. Say that Quip didn’t quite yet have a feature that you needed. Knowing Quip’s goal to build support across all devices, you’re more likely to go back the next time you’re considering productivity suites. Plus, by sharing your company vision, you build a hook for your reactivation and win-back emails. Every time you improve the product in a way that serves your vision, you have an opportunity to trigger a message to people who never converted to check in with them on how you’re making more progress towards fulfilling your company vision. If you never include your company vision, then you throw away better chances to reconnect, and your trial periods will be one-and-done.